Keith kicking goals with new job at Port Stephens Coaches, VIC. | MAX Solutions. MAX Employment Maitland customer Keith after securing new position as coach driver. 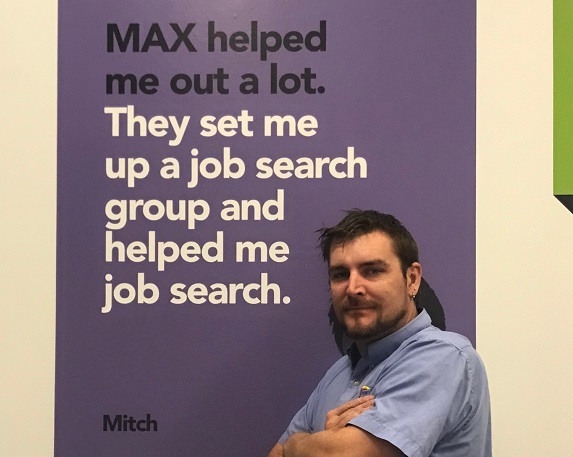 33-year-old Keith came to MAX Employment Maitland in mid-2016. He has dyslexia, was depressed and at risk of being made homeless due to financial hardship. Keith had just saved up to buy his dream car and was adamant he was not going to give it up. He was going without food in order to make the repayments. When he came into the Maitland office he was extremely thin and in poor health. Maitland Business Manager Jo Montague worked with Keith to identify his ideal job, which was to be a coach driver. She also supplied Keith with fuel vouchers, food vouchers and contacted the local church to arrange food parcels for the short term. Keith was then linked with a MAX Health Service Officer to help manage his depression and prepare to re-enter the workforce. An opportunity arose with Port Stephens Coaches, a big employer who offer full driver support to all employees. Jo assisted Keith in applying for and securing the position. Keith has now been working full-time for over six months in his dream position of a coach driver, has stable accommodation, and best of all, got to keep his car. Keith is happier than ever, managing his depression and continues to be support by the Maitland health team. If you or someone you know needs assistance in gaining or maintaining employment, you can find out more about our services at maxsolutions.com.au/find-work.